K2 2010 - another summit bid brewing? We have had a great deal of movement over the last few days with the return to BC of the summit bid group, lots of rain and snow and the departure of a number of team members. Remaining at BC for a second attempt has been Brian, Meagan, Chris, Aziz, Farhad and Fabrizio. There appears to be a very good opening in the winds from the 3rd to the 6th of August with winds as low as 5-20km/hr so this is good news and we do have plans for some members to leave bc on the 2nd for a summit on the 5th at this time. The bad news is that there appears to be an accompanying weather pattern that will include snow up high and rain down low. For them to have a reasonable shot they'll need to have a gap open up for at least the 4th and 5th. All eyes are on the weather for the next 48 hours! I spoke to Fabrizio at length last night and he was optimistic about the situation...fully stocked camps to the shoulder, a route in to the shoulder, a strong team of climbers assembling, the chance that the Abruzzi teams might get to the join the push this time and a weather report that is promising. He noted that the last time up was his 10th run to the shoulder so hard to imagine someone who knows the route and conditions better. We'll hope that Meagan, Brian and Chris are ready to go and have news in the next few days about the exact plans! On the 28th a number of members, running low on time or sensing the risk level too high on the route, made the decision to depart BC and they include Ed, Garth, Luis, Lakpa, Tshering, Katrina & Tom (one of our trekkers!). They were accompanied by three of our HAP's Taqui, Ghulam and Asgar. I received a call from Luis a short time ago and they are out to Skardu now after a pretty serious effort. With the weather conditions so poor, rain, snow and wind, they opted to avoid the Gondogoro La and came back out by way of Askole. As it was they had numerous landslides and river crossings that made the objective hazards on the mountains pale in comparison. They made it back to Skardu at 1:30am after a pretty epic effort and all are appreciating a stable floor beneath their feet! At this time there are no flights to ISB and the Karakoram Highway is closed with landslides - so a few days in Skardu resting up may become mandatory. We'll have more detailed reports on the trek out in the days ahead and have updates on the summit bid shortly. Fabrizio and Chris are planning to made audio dispatches daily during the push so stay tuned! Myself, Rob, Jo, Mike and Ian hiked out from Broad Peak Base Camp on the 20th of July. We were joined by our talented cook and guide Deedar and seven strong porters, heading for Skardu by way of the Gondogoro La, a snowy high pass of about 5600m. This route breaks away at Concordia, heading south towards Chogolisa, passing the Gasherbrums along the way. After hiking for 8hrs on snow, ice and moraine we came to Ali Camp, nestled in a rocky outcrop overlooking a huge glacial basin. We took a few hours rest and enjoyed Deedar's spicy meal of chili yak and chapatis, complimented by warming chai. We woke at 2am to the sound of snow on the tent, but to our relief it was rather warm once we got moving. Walking by headlamp at night never ceases to inspire me, a totally different world, with the sound of the snow crunching under our feet, spindrift blowing in your eyes. As the dawn approached we caught sight of the pass ahead of us, a steep passage between even steeper slopes. We were joined by 2 members of the Gondogoro Rescue team - there to ensure the fixed ropes are in place and secure. Our views were limited upon reaching the top of the pass, low lying cloud but with the morning sun breaking through in places offered us a glimmer of hope for the remaining 8hrs of hiking still ahead of us. The far side of the pass is much steeper and we made good use of the fixed ropes. As we approached the snow line down the valley Rob and I stopped, hearing a mighty avalanche on the other side of the valley. This continued for nearly 2 minutes, and at last came spewing down out of the mist. Knowing we were on safe ground, we stood there and took in an amazing sight. This was by far the largest avalanche I have ever witnessed. At the bottom the valley we huddled in a small stone hut, where we enjoyed a hot breakfast of eggs, paratha (fried chapatis) and more warming chai. This set us in good stead, as the next 8 hours consisted of hopping, skipping and jumping our way across a maze of glaciers and down a winding valley. Cresting a ridge, we finally caught a glimpse of Saicho, the beautiful oasis-like camp where we to spend a much anticipated night in the richer, moisture-filled filled air. Coming down into Saicho your senses are bombarded, the sound of the streams cascading and the birds chirping, the smell of juniper and rhododendron flowering and the sight of so much green...plants living and thriving, unlike the bleakness of the Godwin-Austin glacier, where our home has been for the past month. The next morning we had an early start arrived at Hushe in time for breakfast and ready to jump into the jeeps for our drive to Skardu. During the 5hr drive we were able to reflect on our time on Broad Peak, and prepare to head back into our 'real' lives back home. Each expedition is a holistic experience, taxing mentally, physically and emotionally and we take so much away from these times. All the best to our remaining team on K2, and thank you to everyone involved in our 2010 Field Touring Alpine Broad Peak K2 Expedition. Chris just called in to let us know that the effort to get to the top of K2 on the 27th was aborted after conditions were simply too difficult. At 6pm local time he was able to see Fabrzio descending on the last of the slopes and will put up a gabcast when he into BC safe and sound. We know that all of the teams have made the same decision so there will be a lot of regrouping in the days ahead! The weather looks to be very windy for at least another 5-6 days so time will be running out for many of our members. Chris said that he is feeling super strong and ready to wait a while! The history of K2 includes a lot of patience and this year is no different! K2 2010 - summit bid update - C4 established! K2 summit bid update, 9pm local time: C4 Reached in waist deep snow! Fabrizio and the group of climbers trying to push the Cesen route through to the shoulder have succeeded in very deep snow! Late in the day, well after 4pm they managed to plow their way up to 7950m and establish the traditional high camp on the Shoulder. It sounds as if the effort was very serious and took a toll on the climbers. As well with conditions so challenging it may be beyond the the ability of the climbers to make their way across the Shoulder, through the Bottleneck, across the traverse, to the summit and return safely. The morning may perhaps see an effort to extend the hard won ground, but it appears likely that they may be satisfied with the effort and return to BC to rest and await more consolidation of the snow high up. Fabrizio, Gerlinde and others are no strangers to these conditions and last year managed to push quite far up the route in similar deep snow! We’ll see what the morning brings and let you know the very latest when we have it! Chris has recorded a new audio dispatch with the latest on the summit push and you can listen in for yourself below! July 26 - K2 Summit Bid under way! Summit Bid tonight? This is an exciting time on K2 with our lead members pushing to C4, a second group acclimatizing at C2 and the route nearly set for the a second push in the week ahead! Stay tuned over the next 24 hours as Fabrizio will be trying for the summit! Chris has left a most recent audio dispatches (see bottom) at Gabcast and updates us on the plans for the summit bids for the 27th and the 29th. At this time Fabrizio has pushed our route and gear up to C3 and working the route to the shoulder today. Fabrizio will hope to have the route set on the 27th for any subsequent attempts by our team. He is working the route in cooperation with Gerlinde, Ralf and Kinga on this run up the hill. A few of the Polish climbers and Fredrik and Trey are also moving from C3 to C4 today on the Cesen . Good company indeed! It is amazing to think that the Shoulder camp was camp XIII for the ill-fated 1939 American expedition led by Fritz Weissner. At least twice as many tents, more rope food and fuel, all were carried and stockpiled onto the route (Abruzzi) on their push up the hill. In Viesturs’ book he notes that Weissner ended spending 24 straight days at or above 21,500ft , something astounding and unthinkable to do voluntarily today. He and his summit bid partner Pasang Lama, spent quite a few nights at C4 or above while today we might consider just 2-3 nights at or above the shoulder more than enough! For the 27th the summit wind look to be between 10-30km/hr and generally decreasing to midday and on the rise reaching back to over 60km/hr by the end of the 28th. It will be important for Fabrizio and the others to be back in C4 on the 27th and down to C2 or lower by end of the 28th as the winds will be too severe in the higher camps. Second Summit Group – Delayed by weather! Chris and the second wave are running into increasingly poor weather reports for wind and snow on the 28/29/30 and have decided to wait for the next window for any true summit bid. Meagan and Garth have gone up today to spend the night in C2 and take advantage of this good window to enjoy some time on the route. Expected winds on the 29th have changed from 10-20km/hr to now perhaps as much as 30-50 km/hr and worse on the 30th and 31st – as high as 60-80km/hr. The challenge of climbing technical terrain in these high winds and having very little margin for any delays on descent makes the margin of safety simply too small for the moment. Nearly always one must either begin or finish in bad weather on a K2 push but ending in bad weather accompanied by high winds is simply not an option. The winds have been very serious on K2 over the last few days and at many teams on the Abruzzi arrived recently to find their tents destroyed by the winds – sadly a trip ender for at least one team. It appears that none of the Abruzzi teams will be making it to the shoulder in time for this window so a Cesen only summit is ahead on the 27th! Our team tents are still in good shape lower on the hill so this is good news and bodes well for our second team still having gear for them when they go up in a week. We tend not to report much on other teams but you can visit www.explorersweb.com and www.everestnews.com for updates on many of the teams on the hill. The next window looks possibly to be around the 5-7 of August and at this time the group is well set for a second attempt. Farhad and Aziz made a major effort to bring O2 and gear up to C3 on the 25th and today Taqui, Ghulam and Asgar have taken loads to C2 to support any future bids. So our route is well stocked in both C2 and C3 for any urgent needs by the descending summit bid team. One of the great tragedies in 1939 was miscommunication which led to the stripping of the mountain of crucial supplies for the descending team. With today’s lightweight radios, our BC and climbers are able to constantly coordinate movemnt of people and resources. They have the additional ability to call out to the home office or to our agents for anything they need, including calls for helicopters evacs, fresh supplies, changes to the porter schedules and more. In 2003 we took advantage of this ability to order in 2 cases of beer to be sent in by porter. We spent many days on the hill dreaming of tasting the cold rich brew, which was to take 10 days after ordering to arrive. When the laden porters arrived we prepared ourselves for an indulgent day at BC. The cold cans were spread out and cracked open. They tasted great and we felt ourselves relaxing already! Then, as we examined the cans we noticed some small print on the cans that shook our souls to the core….”non-alcoholic malt beverage”. Yikes! One makes due with all manner of hardships on an expedition and this turn of events we simply took in stride. Using all our powers of denial of reality we allowed the placebo effect to take hold. We enjoyed a faux-buzz as much as any normal two-four of Molson would have done for us back home! Watched “180° South – Conquerors of the Useless” last night and highly recommend it for anyone with the least bit of wanderlust! The filmer, Jeff Johnson, retraces the journey Yvon Chouinard and Doug Tompkins took from the states to Patagonia in 1968. It is full of wonderful footage and thought provoking quotes and delightfully stitched together. In the movie there are lengthy interviews with Chouinard and Tomkins in their huts in Patagonia and these scenes alone are worth the price of admission. Here is one that certainly will inspire conversation around the climbers table! K2 summit push is on! Trekkers out to Skardu! Our Broad Peak only folks, Ben, Rob, Mike, Jo and Ian are all the way out to Skardu and hot showers! They arrived on the 22nd after moving very quickly from BC, over the Gondogoro La and out by Hushe. Ben will write a nice note in the next 2-3 days along with some pics from Broad Peak and the trek so stay tuned! The members are taking the 2-day ride back to Islamabad by way of the KKH (Karakoram Highway) as there were no flights for three days and not much hope for the backlog to empty soon! K2 Snowy Days, Summit bid brewing? The same weather that plagued the airlines has left lots of fresh snow on K2 and in the base camp. I have spoken to Fabrizio and Chris and they said at least a foot of fresh snow is now on the ground, which, along with very high winds up high, has created dangerous wind-packed snow conditions. This sort of new light snow on top of an old icy layer makes for high avalanche conditions. They felt that it would need to take at least 2-3 days to see the consolidation of the slopes and for this reason delayed the main teams departure. Early on the summit day on Broad Peak Chris had dug an avalanche pit and found more than 4 layers of this wind slab. When they felt the slope settle and move 6 inches under them they knew it was time to turn about. We’ll hope in their first foray back up the Cesen that they do not find the slopes to be unstable. There is an excellent period of low winds right now and Fabrizio has moved up the route along with at least one other team to push the route through. If all goes well he (and likely other teams!) would be trying to establish the route through the bottleneck on the 27th and perhaps consider a summit bid. On the 26th Chris will bring the rest of the team up to C2 and they will hope the window holds for the 29th. We’ll hope that on the 27/28/29 that our team can be high on K2 and at least reaching C3 or C4 if not going for a summit bid. I am not convinced that the window is large enough for a summit bid but we’ll hope for better forecast in the next 2-3 days! We have until the 8th of August so nearly 2 weeks remain for a summit push. If we can’t find the top during the 27/28/29 window we’ll still have nearly 10 days left after that. Pray to the weather gods!!! One nice thing about the snowy weather is that it has allowed for some good rest for all the members. For many of them, having worked hard to 7500 – 7700m on Broad Peak, they now have a great combination of acclimatization and rest coming into the push on K2. It has also given everyone an opportunity to climb a whole bunch on the more moderate slopes of Broad Peak before coming onto the steeper ground of K2. Chris mentioned this morning that he was convinced that the idea of acclimatizing on Broad Peak first has been a great idea…using much less energy to gain the acclimatization and avoiding significant objective hazards. As well members have had a good chance to really understand what it takes to climb in the Karakoram vs Everest/Cho Oyu style climbing. They now step onto K2 with a clearer sense of their own abilities and retooled goals. Chris noted that to a person all of the members have felt this way as well! One of our team members from last summer, professional film maker Dave Ohlson, has made a video which you will enjoy! It brings you all the way from Skardu to the mountain and back again. His footage will transport you to the Karakoram in a way I have seen few videos come close to! Chris has left an audio dispatch for you to all enjoy with the very latest! It seems a trip to the Karakoram is never done with providing the adventurous with yet more delights. For all of our trekkers (exiting by Hushe) they pass under the steep faces of Mitre Peak, Chogolisa, turn a corner, and spend the night camped across a glacier from the high snow-laden Gondogoro La. Early the next morning they stomp their way across the glacier, ascend the moderate slopes to the high point at just under 6000m, and blessed with views to a myriad of 7000 and 8000m peaks. They then descend into the Huispang Valley and encounter living things for the first time in a month. Scores of wild flowers, small pine forests and rambling sage brush fill the senses. I have yet to speak to someone returning through this valley that was not taken aback by the smells and sights. Rising high above, like a sharks fin, in the coveted Leila Peak. To climb it would be quite a challenge for most alpinists but a few very ambitious folks have even tried to ski down it! This includes Fredrik Ericsson who is on K2 as we speak! The view during the first day down the valley is dominated by the Masherbrums and though they be not of 8000m pedigree they are daunting to look at an imagine how to surmount them. Masherbrum (originally called K1) stands # 22 in the world at 7,821 m (25,659 ft) and is a beautiful mountain. The first expedition came in 1938 and the peak was finally climbed by George Bell and Willi Onsoeld in 1960 by the southeast face. During the trek out there are numerous rivers to cross and most if not all need to be either leaped across or waded through. Wading is safer but the water in bone jarringly cold and it takes a few minutes after getting back out to feel your feet again. The skill of the porters included knowing where the slights submerged rocks are and enables them to do triple jumps that would surely qualify them for the olympics! Below is an excerpt from my trek out in 2003. When our trekking group is back out to ISB we’ll look forward to having lots more fresh images of Broad Peak and the Gondogoro La/Hushe Trek! After a short day hike to Concordia we made our way on the 24th to Camp Munir, by way of the spectacular Vigne glacier, where we stopped in preparation of a very long day to come over Gondagoro La. It should be noted that the 24th of July was the only day all summer in which we experienced any rain - a short 2 hour sprinkle. Wrested from our group sleep-over in the mess tent at midnight, we trudged like zombies in single file across a large sweeping glacier and up the steep snow slopes of Gondagoro La. Fixed ropes made the ascension very easy and less than two hours later we found ourselves in pitch dark on the pass. So much for the breathtaking panoramic views of the entire Karakoram range! The descent was a bit more harrowing as icy fixed ropes held onto by hand simply do not have the staying taking power of a figure-8 and harness!! An exciting 2-hour descent brought us out onto the flat glacier below and the start of a 20km adventure across a dry glacierscape, moraines and mesas all the while in the awesome presence of the Masherbrum group. By 7pm all of us had made our way to camp where we encountered a Nepal-style tea house with coca-cola and sprite which we consumed by the gallon. Along the way Walter made friends with a man from Karachi who offered him real coffee and great hospitality, While Walter sipped cappuchinos Fred and Sultan awaited him asleep by a huge raging river crossing!! Fred and Alex had both suffered over the pass with gastrointestinal problems that left them vomiting for several hours. This malady had struck Julen and Patxi the day before and was soon to hit Walter and me in the days to come. We think it had to do with the dzo (a cross between cow and yak) meat we had in Concordia and Munir. During the course of this day it seemed that we were suddenly in a different world. A single day’s transition from snow and ice, boulders and stones to sage brush, gnarled pine trees, wild flower meadows, wooded glades and golden wheat fields. Too much for our senses to take in and we sipped cokes in bewilderment in the shade of large trees. 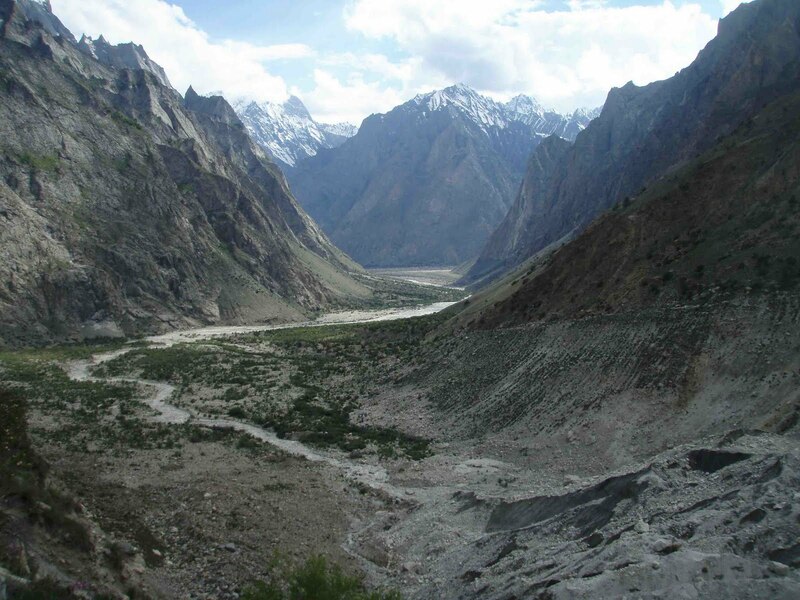 We were all staggered that it should take such little time to return, from the stark environment of the Karakoram, to the gentle world of the Hushe Valley. I personally was reminded of the unbridled joy expressed in the wonderful image, taken by Galen Rowell, of a returning Karakoram climber standing to a small grassy knoll with arms stretched high and rejoicing in the return to the world of living things. It seemed more than serendipity that Walter should make nearly the exact motion as I approached him in a similar spot!! It is quite a thing to experience the transition back to the world of birds and butterflies after being in exile for 35 days. The next morning we took an easy 3-hour stroll down to Hushe and the home of our high altitude porter Taqui Mohammed. We were greeted at the town limits by singing children and treated to a fabulous home-cooked meal at Taqui’s house and felt welcome and at ease in this small but lush town at the edge of the populated world. Soon we were loaded onto the trucks and on our way back to Skardu and the K2 hotel. We left the mountains sad to lose the simple camaraderie of our small team and the strange community of climbers we had found but eager for showers and soft beds. Our team is now turning its attention to K2 and beginning to move gear over today and tomorrow. This comes on the heals of reports of sad news of a Bulgarian climber who has died in C2 on the Abruzzi. Our sympathies go out to his family and friends and hope that there is some small consolation in knowing he was in a very beautiful place living a dream at the time. Even for the well acclimatized and prudent there is always the threat of altitude sickness. Any climber may do their very best to stay within their limits but we are talking about real human limits to be climbing at these high altitudes. As we move from Broad Peak to K2 we encounter an even high summit and greater risk of objective hazards. In the weeks ahead our team will be constantly making decisions and revision to keep the safety margin as high as possible. I have confidence that Fabrizio and Chris, who have both been on K2 before, will making the prudent and cautious choice whenever possible. Broad Peak Team in BC! K2 up next! Our team called in from BC on the evening of the 18th to let us know that the entire team was down safe and sound in BC and that our team had cleared the remaining gear from the hill. After a few rest days the team heading to K2 will begin to shuffle gear over to our BC at K2 and prepare for what looks like a possible window for C2/C3 around the 25-26 july. A better window for summit bids looks to be on the horizon for around the 30th and we'll be watching the forecast very carefully in the next few days to see how these two windows play out. I should have more information about the individual decisions of climbers and departure dates in the next 24 hours. At this time a number of folks will be heading out on the 24th and then a second group around the 28th and then the final departure around the 8th of august. We are very happy to hear that some other climbers who had decided to push on to the summit were able to reach the top. We know that the descent became quite difficult and one even spent the night out at 7800m. Seems our team made the prudent choice to head back to camp - especially given that they had enough concern for the slopes to fix 300m of rope on the way down (in sections that they had climbed up without ropes!) We are glad that the ropes our team used were then in place to protect the descent of those who had gone on to the top. Sounds like at least a few were quite happy to have them at hand! Ed Viesturs notes in his K2 book (p20) that “I am proud of the fact that on all thirty of my expeditions to 8,000m peaks, I never once had to bivouac. On several occasions, I turned back around short of a summit rather than submit to a night out without shelter.” Included in this list is a first attempt on Broad Peak in 1997 when, as noted on his own site, www.edviesturs.com, “they stopped just 150ft from the true highest point. The simple traverse was threatened by severely unstable snow. It was early in the morning and we felt quite strong, but the risk was too great to continue simply to gain a few more feet in altitude.” Ed returned in 2003 to polish off the last 150ft! Seems our crew is in good company with the decisions they made! The mountain will still be there for next year and we'll be back! Broad Peak makes for a great 8000m climb with the combination of one of the planets greatest treks and climbing that remains varied, interesting and accompanied with superior view. We are looking forward to coming back in 2011 for our 7th trip to the mountain and are already accepting applications. We hope to be on Nanga Parbat, G2, G1 and Broad Peak next summer and possibly even a return to K2! Join the most experienced Karakoram 8000m expedition company for a great trip in 2011! Broad Peak Summit Bid Over: Team safe in C3! Fabrizio called in from C3 (at about 10am local time) to let us know that the entire summit team was safe and sound and back in C3 after a great effort on the mountain. The snow conditions were apparently very bad and largely unconsolidated sugar snow. As they neared the col (perhaps 100m below) they felt a shift in the snow pack and made the decision to call it a day with the risk level simply unacceptable. Armed with more than 300m of rope they had brought for the summit ridge they were able to secure the descent quite safely and returned to C3 without mishap. A few of the other teams also turned about or had done so earlier while Fabrizio reported that a few very experienced climbers had continued on at that point. We’ll have more details when the team checks in again at the end of the day. We spoke only for a few minutes as they were making preparations to clear camp 3 and begin the descent to BC. With Ed, Garth, Aziz and Farhad coming up to help they hope to clear out the mountain between today and tomorrow. As the weather becomes dangerously windy for a number of days the “Broad Peak only” folks have run out of time on the mountain and will head out on the 23rd or 24th after resting up for a few days. With planes to catch and lives to return to there simply is not any room to maneuver for several of them. A few of the Broad Peak only folks may opt to extend their stay as our permit on Broad Peak remains in force until the second week in August. Additionally some of our double team may come back over for an alpine run at the hill…we’ll see! I have been thinking what to write if they had topped out and it would certainly have included a Norwegian first for Jo, a second 8000m summit for Chris in a short span (he topped out on Cho Oyu in May), a first 8000m summit for Ben and much more. It would have been fun! Instead we have too look beyond the idea of the summit as a rationale for these long and demanding expeditions. For some it will be a last 8000m climb and serve as a memory bank for waking on hot summer days and daydreaming of crisp crunchy snow and views to the world below. For others it will be one more arrow in their climbing quiver to be brought out and used on another climb. Some small lesson gleaned from this experience will tip the balance in their favor in the years ahead to enable them to top out or return safely. I watched a great documentary on Messner by Outside TV recently and it is hard to keep track of the times that Messer turned around on climbs knowing he was not yet ready. Each time he tried something new and unknown (like soloing Nanga Parbat or Everest!) he learned something new about himself and at the same time expressed himself and felt these were the reasons to climb. Not for the summit, not for someone else, but for expanding his own horizon and learning more about himself. These lessons and experiences enabled him (along with unmatched willpower) to go on to accomplish great things in mountaineering, adventuring and politics. I like that he hopes for each generation to enjoy the unknown and to wonder about the possible. He expresses an additional wish that the tracks of those who came before to be covered by wind and snow so that each young explorer to refind it for themselves. Viestur’s writes early in his book on K2: “ Don’t ever do that again, if you want to stay alive. Listen to you instincts, and follow them.” (p4) He had gone on to the top along with Charlie Mace and Scott Fisher against his own inner doubts and notes it as the biggest mistake he made in mountaineering. He ascribes his error to pure indecision. Unable to decide to go up or down he followed the energy of the other two climbers. (To fans of the band Rush then the line “if you choose not to decide you still have made a choice!” may serve well!) He carried this experience and lesson with him on every expedition after and hard to know how many times that one arrow kept him out of harms way. We each carry stories in our mind while we climb. The simpler and clearer they are, the more useful they are at high altitude, when hypoxia, cold and exhaustion robs us of our cognitive skills. Fabrizio, Chris and Ben bring with them many years of climbing on 8000m peaks and between them carry a wealth of small stories to help guide them to good choices. Our members have also come well armed - with years of climbing included trips to Everest and K2 among them. In this case our team has had a great reason to turn about, listened to their inner stories, made the decision and followed their instincts. I am proud of the leadership, teamwork and prudence of our guides and members. They worked as a team to push the route and then agreed as a group to call the push and descend together. Well done! We’ll have a larger update on the details of the summit bid in the next 24 hours to stay tuned! While the team has been on the hill we have had quite a few signups for trips ahead and now have the following trips confirmed with spaces remaining. Join FTA for one of these great trips! Exweb published a great history of K2 (www.explorersweb.com) as as we now begin to turn our energies to the “big mo-fo” it will be well worth the read. Also pick up a copy of Ed Viesturs K2 book for very genuine insight on expeditions to K2! Broad Peak July 16: summit bid begins in 9 hours! Fabrizio checked in a little after 5pm local time at C3 (7100m) on Broad Peak to let us know that everyone is doing well and the summit bid will get under way in just 9 hours! At this time we have Ben, Meagan and Taqui in a Marmot Thor 3-man tent in C4 at 7300m, Fabrizio, Brian, Chris, Jo and Mike Nixon in Thor 3’s in C3. All of these members are feeling strong still and will be making for the summit between 2 and 3 am. During the day today Rob, Ghulam and Asgar all had challenges with keeping their feet warm and have wisely decided to descend to BC. Brian seems to have recovered sufficiently from his GI troubles and is ready to give it a go. Jo seems to have run into a little GI trouble himself so we’ll hope he manages to shake it and at 2am he can be off for the top. Both Mike and Jo are sleeping on O2 and will be climbing with it during the day so they should have the warmest toes on the hill! In 2003 we had a pair of Spanish climbers who had been on Everest who said it was much colder on Broad Peak - they had to turn about on two successive summit bid with cold feet. One of the challenges on Broad Peak is that the sun does not hit the slopes til well into the morning. So climbers are looking over at the slopes of K2 drenched in sun while shivering in the shade on Broad Peak. They will be looking forward to reaching the summit ridge and the warm rays there! Oddly enough on my last bid the problem was overheating as the temperature on the summit ridge was as high as 53°F (hence the baseball cap at 7900m in the last dispatch!). To reach the summit ridge they will have to force their way through sugar snow which according to Ben began approximately 100m above C3. This snow impeded their progress significantly and so rather than waste too much energy they pitched C4 about half as far as they had hoped. In the morning they will join the wave from C3 which will include lots of fresher legs. The plan is to share the snow plowing to the col in the same manner a peleton rotates the lead riders to break the wind. The slope below the col will be very difficult if it is sugary snow and will take some careful climbing. In good conditions it is quite straight forward (perhaps 50°) but can also be quite rocky later in the season. Along the ridge there are numerous enjoyable steps of rock and snow and the views down to both sides is extraordinary. While the side towards base camp is steep, to the Chinese side it drops off nearly vertically and provides a dramatic view! They will also have great views of the sunrise on K2 and that alone is worth the price of admission! Ed and Garth are in C2 and will assist in breaking down the C3 camp tomorrow. Luis, Katrina, Lhakpa and Tshering have cleared their gear from the hill and will be resting up for the K2 climb ahead. There appears to be a good weather window around the 26th July so perhaps we’ll have more summit bid reports coming up again quite soon! Fabrizio has left a dispatch from C3 at 7100m and you can listen in below! So members are letting life happen to them and if toes are warm and energy is good they will continue on to the top. If toes get chilly and their energy wanes they will accept this too and head back down satisfied with a great adventure in the Karakoram. K2/BP 2010 - Summit push update July 15 #2 - all well in C3! Fabrizio has now left a dispatch with an update from C2 than includes the update that he has been in contact with the group at C3 and everyone is doing great up there. We’ll expect more news at the end of day (local time) on the 16th when our team will check in again! Here is Fabrizio's audio dispatch – enjoy! In preparation for the team's summit bid I am reading over my own dispatches and journal from 2003 from my second summit bid which came with next to no time left before the end of our permit. We had a smaller group that season and just one HAP (Taqui!) and hauled nearly all of our own loads. The level of infrastructure we now have barely resembles that inaugural trip for FTA but does little to change the fact that a summit day on Broad Peak is a serious and demanding affair and will take all our climbers can muster to reach the top! I hope my note puts you all in the climber’s boots! “When we last left off Fred had just come down from the Rocky summit after a fine bid for the true summit. He arrived exhausted and content at C4 as Walter and I were arriving from C3. Fred was spent and ready to head down after a good sleep. Walter and I made about melting water for a soon to be undercooked supper at 7500m and learned what lessons we could from Fred. We decided to leave even earlier than Fred had in hopes that this would give us the extra two hours we would need to reach the true summit. After a truly horrible and restless night in the lumpy and icy C4 tent, kicking each other for space and trying our best to hydrate and force some food down, we roused ourselves, melted water for the summit push, managed to warm up and put on our boots, wiggled into our down suits, jammed our hands in to our large overmitts and left the relatively warm confines of the Millet tent’s frosted interior. The air at 7500m at 6am was brittle but mercifully calm and we left hopeful. Walter and I each reached the col during the course of the day but neither of us had moved quickly enough to be left with time for the true summit. Walter contented himself with 7800m and fine views for his personal summit. I had felt stronger than Walter early on and reached the col at 11am with time for a run at the rocky summit. Pushing on up the ridge alone for 3 and a half hours I reached the second ante summit at 2:30pm. In consult with Mike at BC we decided that I did not have the reserves of time and energy to proceed to the tantalizingly close rocky summit. A mere 50-100 vertical meters away but too far for safety. Alone on the narrow ridge, 500m above my nearest companion (and 3000m above the next) and already a bit past my turnaround time, I selected a small memento, took as many photos as I could, slowly turned around and began what I knew would be an arduous and exacting two day descent. The demands of working my way down the well-seasoned and ever slimmer feeling fixed lines across narrow corniced ridges and short rocky steps kept me well occupied and time passed quickly. Before long I had reached the col, then the slopes below and finally it was 7pm and the sun was setting on a small tent just before me. Walter popped his head out and handed me a hot chocolate. What a pleasure it was to be in the company of a friend once again! Our attempt came at the end of the expedition with essentially no days left and the day after our summit attempt was all we had left to return to be before the camp was broken down the following day. As it turned out a few other teams headed to K2 had “utilized” some of the fixed line below C2 and some had pulled out due to melt out so there was considerable downclimbing unroped with full loads that took great care. It is an essential part of climbing that you need to be able to come down what you go up and in a worst case climb down what you cannot rappel. I can still recall with great clarity a number of the steps I made that day on very hard black ice in crampons that had dulled a bit during the summit attempt - they are moments of pure focus and in the end part of what draws some of us to climbing. “ Their teeth were going to get sunburned they were loving it so much. Meanwhile I was gasping for air, and worrying about that summit banner … it was one of the greatest climbing days of my life. How’s that, you ask? Well. … it’s hard to explain. But it’s something like this: when you get on a mountain wall with a few thousand feet of empty air below you, it catches your attention. Of course part of you says oh my God, it’s all over. Why did you ever do this? But another part of you sees that in order not to die you must pretend you are quite calm, and engaged in a semi-theoretical gymnastics exercise intended to move you higher. You pay attention to the exercise like no one has ever paid attention before. Eventually you find yourself on a flat spot of some sort – three feet by five feet will do. You look around and realize that you did not died, that you are still alive. And at this point this fact becomes quite exhilarating. You really appreciate being alive. It’s a sort of power, or a privilege granted you, in any case it feels quite special, like a flash of higher consciousness. Just to be alive! And in retrospect, that paying attention when you were climbing –you remember that as a higher consciousness too. You can get hooked on feelings like those: they are the ultimate altered state. Drugs can’t touch them I’m not saying this is a real healthy behaviour, you understand. I’m just saying that it happens." We also like to leave a clean hill and as we were the last 2 down we had a bit to gather including trash from out team and a few others. Walter had not felt great (a bit if GI kicking in) and I encouraged him to cruise back to BC leaving more for myself than I had bargained! In the end I had 2 backpacks strapped together (one upside down atop the other) and a third bag I roped up and literally kicked all the way down! “For Walter and I the climbing was not done and we descended on the morning of the 22nd both exhausted and with great care. Missing fixed lines and black ice under slushy snow added greatly to the objective dangers of descending. In clearing out C3, C2 and C1 I became encumbered with additional weight that left me descending from C1 in the dark. A warm night, little water and low motivation led me to use the entire night in a trancelike descent to BC. I was blessed with a stream at 1am from which I drank greedily but the blessing turned into a nightmare when I rappelled into the waterfall just below it at 2am. My hands and arms soaking wet I finished off the evening rappelling into [and climbing out of!] the 10m abyss of the crevasse which no longer came accompanied with a snow bridge. We’ll hope our crew is able to keep their speed up working as a team, return to C3 or lower the same day and then share the loads coming down. With our 5 HAPs we surely have more shoulders to help out this year! Think of our crew leaving their cramped but warm tents for the crisp open space of Broad Peak’s last 700-1000 meters! K2/BP 2010 - summit push in C3 on Broad Peak! Fabrizio and Chris called in from C2 just a few minutes ago to lets us know that all was well for their group and that they are settled in for the night! After a day of very hot weather and snow balling up in their crampons they are having an evening of mild wind and if our forecast continue to be good they will have even more modest winds tomorrow for the move to C3. They hope to push off early tomorrow to avoid the heat of the day and to also give themselves the longest time for hydrating, eating and resting before making off for the summit early on the 17th. The summit today, in contrast, was blowing very strongly as predicted and was likely above 70km/h. Over the next 24 hours we expect this wind to subside to less than 40kph and hopefully as low as 20km/h. The two groups have a scheduled call coming up in the next few hours and Fabrizio or Chris will put of a gabcast after they check in with the group at C3. At this time we have Ben, Taqui, Ghulam, Asgar, Meagan and Rob in C3 and Chris, Jo, Mike, Ian, Brian and Fabrizio in C2. Brian has been having a bit of GI trouble so stayed back to try to recuperate and hopes to continue on with the second group if he is feeling up to it in the morning. A very tough time to get a stomach bug as anyone who had the malady knows it can really sap your energy. Our guide Brad Boehringer managed to knock off Cotopaxi this past January in spite of a similar illness so we'll hope Brian feels up to it and has the necessary reserves. We have Aziz and Farhad coming up tomorrow to C2 to be in reserve in case of any need of assistance for the summit push. They are well rested now and have been the fastest and strongest of our HAP's this season so should be able to move up as climbers descend if needed. Coming along on the summit push are a Slovak team, a Basque team and a Norwegian team so there will be quite a concerted effort by many climbers to push the route through. Hopefully the warmer conditions of the last few days will make the sugar snow firm up below the col where previous teams have been stopped. Check in to gabcast in a few hours for more and I'll be posting it to our site as well! K2/BP 2010 - summit push in C2 on Broad Peak! Just off the phone with Fabrizio and had a great conversation about everything that is happening on K2 and Broad Peak and I am as excited to follow them as they are to climb! Everything is aligned really nicely and if the conditions allow we’ll be seeing our team off late on the 16th or early on the 17th for a summit bid! Today Ben, Rob, Brian, Meagan, Asgar Taqui and Ghulam made it up to C2 and got down to the work of resting, eating and hydrating! They are feeling great and hope for a great sleep in anticipation of a key push to C3 tomorrow. On the 15th Fabrizio, Chris, Mike, and Jo will head up to C2 while the first group with Ben will move up to C3. On the 17th they will hop again as Ben’s group will go to C4 and Chris, Fab, Jo and Mike will replace them in C3. As Chris and Fabrizio have been moving well and Jo and Mike will be utilizing O2 they will leave a bit earlier for the summit bid (on the 17th) than the C4 group and hope to join them for the move up the col and with luck across to the summit! At this point Aziz and Farhad are resting after their hard work on K2 and will plan to join the team on K2 for the push to C4. The remaining members are all using this push up the hill simply to acclimatize for k2 and will be taking it easy and clearing gear as they come down, This includes Ed, Garth, Katrina, Lhakpa, Luis and Tshering. We have one BC services member only, Ian, and he’ll be making his own decision about summit timing but at this point looks to be joining along with the second group. Jo Valseth is trying to become the first Norwegian to summit Broad Peak so we all wish him and his country great success. There are other Norwegians on the hill so with good luck there may be more than one countryman atop Broad Peak in the days ahead! As always we try to play nice with other teams for fixing routes and sharing tents whenever possible and Fabrizio has been working very hard with the other climbers on the Cesen to ensure we all minimize our load carrying. So tents he and Aziz and Farhad carried up will be shared with at least one other team and we’ll likewise be spending a few nights in their tents during our push. The hope is to save as many resources for all teams as we can. Really nice to see this good cooperation and we’ll hope it continues throughout the summer! As I continue to read Ed Viesturs book on K2 he comments a number of times about the differences between teams and groups and how they respond during times of crisis or challenge. I think that this is certainly an issue to be taken very seriously and I believe that we have a large enough team coming together and enjoying each others company that we have a strong team headed up Broad Peak and will have another on K2. The more dance parties and Jenga games we play the safer we are up high…go Jenga! Fabrizio or Chris will drop a Gabcast every night so be sure to check the gabcast page as well as here for news each day! Field Touring Alpine Audio Dispatches #92: Fabrizio calls in From BC with the Summit Push update for the 14th July! ps: Rewatched the classic flick “K2” last night and while so much of it makes no sense at all logistically and practically it does have numerous poignant moments and does offer a lot of insight into the old question of why we come to these high, cold and steep mountains. K2/BP 2010 - July 13: Summit Big under way for Broad Peak! It is a rare thing to be climbing an 8000m peak and even rarer to be climbing 2 of them at the same time! Indeed we have our team on Broad Peak with C3 already established and now we have installed C2 up the road at K2 and with that FTA is climbing the 2nd and 12th highest peaks on the planet at this time! Many months ago when we mapped out how we would try these two peaks side by side we had envisioned that if our guides and HAP’s could be in great form and the route and weather permitting that we would hope to have Fabrizio making a run up to C2 or C3 on the Cesen while Chris and Ben were finishing off the route to C3 on Broad Peak. Sure enough this has come to pass and we are on schedule. Additionally the weather appears ready to give us a short 2-day window of low winds for our first summit push of the summer! On the 17th July we hope to have members on the top of Broad Peak so wish us luck! Fabrizio called in from C2 on the Cesen route on the 11th to let us know that all well on the Cesen route. He and Aziz and Farhad came over to the K2 BC on the 10th and then scooted up the route in something over 4 hours to reach C2. Fabrizio said that the route was in the best condition he had ever seen it down low and that they did not even use fixed rope (placed there so far by the polish team) until just below the camp. Unfortunately at this point the conditions turned more icy than he has ever seen. So a strange pattern of too much snow low, ice in the middle and likely sugar snow above that we have seen on Broad Peak, continues on K2. Loaded with 3 tents, 300m of rope and their own sleeping gear the trio hoped to complete fixing the route to C3 on the 12th but was turned back by high winds and descended BC. They are using the 13th and 14th to rest and will join the Broad Peak summit push on the 15th. The rest of the crew over at Broad Peak has all come down to BC and is resting up in anticipation of a summit push. After Fabrizio had finished putting in the final line to C3 last week (on the 9th) all of the members made high point tags on the 9th and 10th. Chris and Ben managed to take enormous loads of gear (tents, oxygen and more) to C3 (7100m) and both are feeling very strongly. I spoke to Chris at the Broad Peak BC and he sounded great. He was commenting on how strong he feels in comparison to previous trips to the Karakoram with this now his 6th 8000m effort (Cho Oyu in 2007, Gasherbrum II in 2008, Broad Peak and K2 in 2009 and Cho Oyu in 2010). Ben also is feeling his strongest on his 3rd 8000m trip now with previous shots on Cho Oyu in 2008 and on Broad Peak in 2009. We have been watching the weather very carefully and it looks like the team will have modest winds on the 16th and 17th enabling them to establish a C4 on the16th and summit from two locations on the 17th. The group camped in C3 will leave a bit earlier and join the group leaving from C4. The conditions have so far thwarted other groups summit bids either due to deep/sugar snow or due to high winds. We hope with enough people to share the plowing and a few days of lower winds that we will have a good chance to make the top. On the 14th Ben, Rob, Brian, Meagan, Taqui, Ghulam, Asgar will head up to C2 with hopes of reaching C3 on the 15th and C4 on the 16th. Their move to C4 will be a midday move of 2-3 hours and is intended to shorten up their summit day. The exact location will depend on how they are going but likely be approximately 7500m. On the 15th Fabrizio, Chris, Aziz, Farhad, Mike, Jo, Garth, Ed, Luis, Katrina, Lhakpa and Tshering plan to move up to C2 to begin their final push on Broad Peak. Many of this crew will plan to simply spend a night in C3 and then drop to BC in preparation for K2 while Jo, Mike will certainly make a summit bid along with our guides and HAP’s. We’ll be watching the progress very carefully as well as the weather and make a final call about the summit push on the 16th when we see if the weather window is holding. Fingers crossed and pray to the weather gods for great weather!! While our teams are in the field I always try to read a book of history, culture or climbing related to our trip and I am working my way through “ K2: Life and Death on the World’s Most Dangerous Mountain” and enjoying his history, personal philosophy and opinions. I had the pleasure of meeting Ed Viesturs in 2003, when he and Frenchman J.C. Lafaille were climbing on Broad Peak following their trip to Nanga Parbat, and he strikes one immediately as self-assured but unassuming and was extremely friendly and forthright. I am finding the book to be similar and highly recommend the book for a good read! In Viesturs book, in the chapter “The Motivator”, he describes K2 as follows: “A sharp Pyramid of black rock, sheer now gullies and ridges, and ominous hanging glaciers, K2 has a symmetry and grace that make it the most striking of the fourteen 8,000ers. Rising from the Baltoro Glacier in the heart of the Karakoram, K2 is flanked by five other of the world’s seventeen highest peaks. The range, in fact, holds the densest concentration of skyscraping mountains anywhere in the world–even denser than the Himalaya around Everest. Yet K2 soars in proud isolation over Broad Peak, Gasherbrum I, Gasherbrum II and its other formidable neighbors.” (p8) He then describes various climbers reactions to seeing the mountain including Younghusband and Messner but sums it up best with his own response to seeing it from above Paiju “That is one huge mo-fo!” When our bid on Broad Peak concludes we’ll be heading over to eh Mo-Fo and likely that will be on the 23rd when the porters arrive from Askole. They’ll move the bc over to K2 and then support he Broad Peak only folks (Ben, Rob, Ian, Mike & Jo) back out to showers and shaves in Skardu! In addition to our regular 8000m trips to Broad Peak, Cho Oyu, Gasherbrum II, K2, and Makalu we’ll be adding Nanga Parbat in summer 2011 and Everest in spring 2012. With good luck we’ll have Kanchenjunga, Manasulu and Shishapangma trips as well over the next 3 years. For the moment we are focusing on this autumns Cho Oyu, Island Peak, Ama Dablam, Cholatse, Everest BC treks, Satopanth and Tharpu Chuli. We have spaces remaining on most of theses trips so drop us a note if you are interested in joining our great guides and staff for a trip to Nepal, India or Tibet! See our expeditions and treks pages for more! K2/BP 2010 - June 9: C3 established! More great news from our team continues to arrive each day by phone, sms and audio dispatch! Over the last few days our team has now completed the route to C3, made a deposit of tents and all members have spent a night in C2! On the 7th our team began to move back up the hill as we noted in our July 7th dispatch. On the 8th the members in C2 (6250m) made a push as high as they coudl on the hill with Brian, Meagan, Mike and Rob all reaching 6600m or so. Feeling strong, Fabrzio completed fixing the route to C3 (7100m) on a perfect day with the entire Karakoram stretched out before him including K2, Angel Peak, Chogalisa, Mitre Peak and much much more. Much of the route between C2 and C3 is along the edge of an enormous drop off and requires great attention. Then, as the slopes ease up near C3, it is possible to really take in the views and enjoy the position (despite the hypoxia and huffing a puffing!). The entire contingent who moved up from C1 to C2 on the 8th will be making their climb to C3 on another great day of fine weather and diminishing winds. We'll have a report soon from Fabrizio and the team as they celebrate Ben Kane's 29th birthday and take a few days of rest until the summit bids begin!! K2/BP 2010 - June 7: headed to C3!! After a great acclimatizing run the last time up and a great rest at bc our team is back on the hill today and making great progress once again. On the 7th Fabrizio made it up to C2 along with Brian, Rob, Ed, Meagan and Mike. The entire rest of the non-pakistani members, Katrina, Lakpa, Luis, Tshering, Jo, Chris, Ben and Garth, are already at C1 for tonight and the HAP staff will come all the way up to C2 tomorrow. On the 8th Fabrizio will finish the route through to C3 and stay the night along with his group and then descend to BC on the 9th. On the 8th the members now in C1 with Ben and Chris will push up to C2 for the night with plans to walk towards camp 3 (or above) on the 9th and then return to BC the same day. We have a great forecast for the next 2-3 days and by the time our group drops back to BC they will be acclimatized and ready for a summit bid. There are some days of very high winds ahead but we'll be ready for to go up in the next good window! Fabrizio said that at least one of the other teams who arrived earlier will be making summit bids so hopefully they will have success and it will bode well for our team! This is an exciting time for our team and we hope to have great news of the progress on the 9th or 10th along with a plans for a summit bid. Fabrizio will try to drop gabcast audio dispatches as he goes and I will post them as they arrive! One of our trekkers, Nikki Wright, is back at home now after a great trek and has sent in some pics from her trek...enjoy them below! K2/Broad Peak 2010 - Happy Canada Day! Heading to C3! Fabrizio has left a few voice dispatches (see at bottom) with the very latest on the team's efforts on Broad Peak and they are impressive to say the least! In just 4 days our team has placed 2400m of rope and established 2 camps with 5 tents each. You can see in the image below the general route and typical camp placements and click on it for a larger view. On the 26th Fabrizio and Aziz and Farhad made it up to C1 from basecamp in a lightning 2hrs and 5 minutes. In 2003 this took me nearly 4 hours on my second time up and I was trucking. I don't know how Fabrizio and the HAP's can go that fast, me thinks EPO or HGH a la Tour de France!! Perhaps injectable epi as in the classic film "K2" during the "take me out to the ball park" scene. If you have not seen this film its a must-see-cult-climber-flick! Just ordered a fresh copy from Amazon! Most normal human on our team are taking between 4hrs and 8 hours to reach C1 and taking a few pics, a rest or two and some breaths along the way! More than half of the team has now spent the night at C1 and by the end of the next few days the entire team will have done so. There had been hopeful plans to move up the hill sooner but snow on the 29 & 30 kept our team resting up at BC. With a nice 2-3 day window starting tomorrow much of the team will be on the move including some members starting rotations at C2. Perhaps half of the team will have spent a night there by the 4th when light snow is expected to fall. Likely we will then be grounded a few days with heavier snow expected on the 5th into the 6th. By the 4th Fabrizio and the HAP's are hoping to push the route into C3. The 5 HAPs will carry approx 150m of rope and this should give us enough to make the critical sections safe. After a series of steeper steps above C2 the route eases off for a large stretch and C3 can be placed in many spots along the way. Typically the height is between 7100 and 7200m and from this high on the mountain BC begins to feel far off and sensation of being on the moon begins to take over. Nonetheless on a nice day it can be well above freezing and a nice place for a cup of tea and a rest. Some years depending on conditions of the team and the route we will add a camp higher up nearer to 7400-7500m which can shorten up the summit day. We had 2 nights in 2003 at this camp and it was glorious spot with great views of sunset on K2. Passing the hours at BC this summer has included marathon sessions of Jenga and you can hear more in fabrizio's dispatch from the end of the day on the 27th in Pakistan. On the 30th they had the entire bc contingent over for a party and Jenga once again played a central role with a 15-person game which included Catalans, Slovaks, Canadians, Americans, Norwegians and more! Apparently Chris and Fabrzio have taken great pains to set up the best BC we have ever had including a cushy floor, strung lights and games galore. The FTA BC setups always seem to be inviting and whether we are in Nepal, Pakistan, Argentina, Ecuador or Tibet we enjoy the company of all the other teams on the hill. Always nice to create a community on the mountains with other folks passing through for a cup of yak butter tea, a game of cards or a sip of Khukuri rum! Fabrizio wanted to be sure we mentioned the amazing job that Aziz and Farhad are doing and they are proving to be the strongest HAP's right now. We had met them last year on the Latok rescue attempt and they had demonstrated great skill and strength and we are glad to have them on our team for this year and hopefully for many years to come! Enjoy the audio dispatches below and stay tuned for more news in a few days!